I haven’t yet written about Engaging the Feminine Heroic, the workshop I attended recently. This was intentional. I find it somewhat difficult to describe in words, and I’m still processing all that took place. Dara Marks and Deb Norton are an extraordinary team of teachers. They guided us on a journey not only of writing but of interior exploration, into our darkest places where we hold long-forgotten experiences and emotions. Our personal Underworld. A truly transformational experience. It would have been a frightening place had we not shared the experience. In a safe and sacred space, we supported and encouraged one another and continue to do so. I wish I could have tapped into the deep well of creativity within my psyche that some of the others reached. I have never been good at timed writing practice because frankly, I’m a slow study. Once I get an idea, I can run with it, but it takes me longer than most people. (I thought of a great one on the drive home.) The stories these women pulled from their personal experience and crafted into fiction were nothing short of astonishing. I felt like an amateur in their midst. I’m still in awe. But now that I’ve learned some of the tricks of going deeper into characters, I will practice them and hopefully enrich my stories. I have long had a few ideas about really strong feminine characters, but now feel better equipped to explore them. 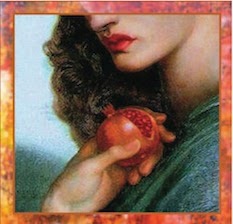 I’m also excited to have learned some details about Persephone I hadn’t known before. Someday I will incorporate them into the revised version of my Goddess Connection story related to Persephone. If you don’t get the chance to take the workshop, I encourage you to read Dara Marks’ Inside Story. You can also follow DebNorton on her Part Wild site. Check out the left side for specific writing posts, a virtual mine of writing richness. Sounds like a wonderful workshop. I can't believe you should ever feel like an amateur among other writers. It was, Susan. Yes, there were some amazingly accomplished women there! Welcome to The Susquehanna Writers! The Susquehanna Writers are authors living in the beautiful Susquehanna Valley in central Pennsylvania. Our genres include suspense, military thrillers, young adult, urban fantasy, speculative, mainstream and romance. Bookmark this blog and visit often!